To develop a turnkey machine for quickly pre-tinning solder in a copper electrical connector. The testing was done in an open air atmosphere. A specially-designed, two turn helical inductor was used to provide optimal heating to the cup end of the electrical connector. Initial tests were conducted with bare parts and temperature sensing paints to establish time-to-temperature and heating profiles. Next the solder paste was inserted into the cup area and RF heat was applied with the RF power supply. The optimum soldering temperature of 390°F was reached in 10 seconds, causing the solder in the cup to melt. Consistent, repeatable results were achieved at 390°F within 10 seconds. 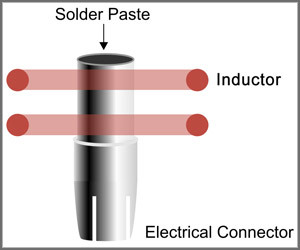 A turnkey system for pre-tinning solder in this type of connector will deliver immediate improvements in speed, consistency and product quality.